Learning how to "beam" a patient without a backboard! Imagine you're on a backpacking trip miles away from a road. Your cell phone is dead. One friend twists their ankle, another is suffering from dehydration, and another falls and bumps their head on a rock. As unlikely as this situation might sound, wouldn't if be great to be able to care for each of them, to call for help and know exactly how to tell rescuers what type of help you need? 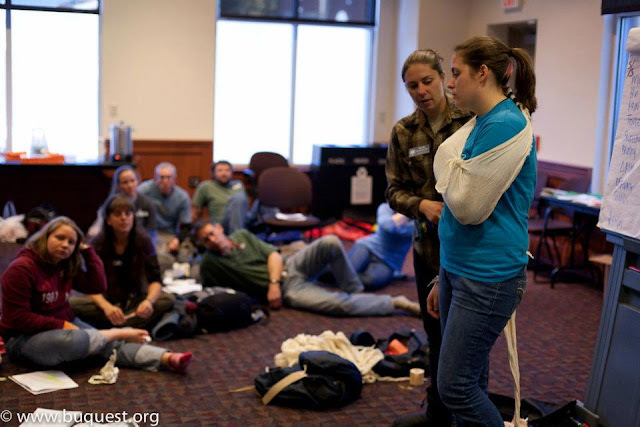 Whether you're a guide, trip leader, or just enjoy getting outdoors, Wilderness First Aid training is a fantastic thing to have. 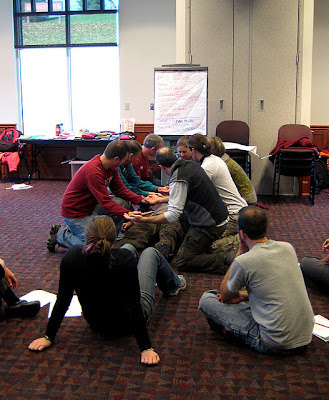 I re-certified last weekend with the amazing instructors from the National Outdoor Leadership School (NOLS) through the Bloomsburg University Quest program, and came home with several important lessons. The skills we learned will enable us to care for people who are far from definitive medial care, and that kind of knowledge is priceless. Find a course near you through NOLS WMI. Taking Wilderness First Aid doesn't mean you'll be able to diagnose and treat specific medial issues, but you will learn basic skills to handle emergencies. It's great to want to help, but don't try to do more than you're trained to do. A WFA class will help you learn how to assess patients, assess situations and make informed decisions about how to keep patients stable until rescue teams arrive. You'll learn how to stabilize the spine of a patient with a spinal injury, for example, but leave diagnosing and treating that injury to the pros. When you're out in the field, be prepared to improvise. On the second day of the course, we dealt with athletic injuries, fractures and dislocations. From a sprained wrist in a fall to a twisted ankle, these types of injuries are common on the trail. But if you're out on a trail run, odds are you don't have an entire first aid kit with you. We learned how to handle these injuries by making splints out of backpacks and using proper taping techniques. Acronyms and rhymes are your friends. The initial patient assessment consists of ABCDE. It allows you to find immediate life threats like airway management, breathing, circulation, disability, and any environmental life threats. Rescuers will also want to know the patient's SAMPLE history, which includes symptoms, allergies, medications, pertinent medical history, last intake/output and events preceding the incident. NOLS has a sweet bandana to help you remember the patient assessment triangle.Yay acronyms and rhymes! No First Aid Kit will be perfect for every situation. That's the first of four first aid kit rules our instructors passed on to us. You're not going to be able to carry absolutely everything you'll ever need, but there are essentials you should have. Those include body substance isolation items (gloves and a mask), a thermometer, wound cleaning supplies (a syringe for irrigation, sanitizer, etc. ), bandages (triangular, gauze, etc. ), and splinting supplies. If you've read the third takeaway, you know you might need to figure out how to make your own splint, but SAM splints are good to have. I'm adding my own essential - a watch. It's really hard to take someone's vital signs without on. The second rule? Know how to use everything in your kit! Even if there's a miniscule chance of a spinal injury, it's better to be safe than sorry. We learned that when you arrive at the scene, the first thing you want to do is to stabilize the patient's spine by holding their head. Even though it might seem silly in some situations, if the mechanism of injury suggests a potential spinal issue, you could prevent them from needlessly becoming paralyzed. You can discontinue spinal stabilization when you've completed a Focused Spine Assessment. EpiPens won't cure a patient having an anaphylactic reaction, but they will buy you time. someone who is allergic to bees is stung, for example, the body responds by sending too many histamines and other substances that can cause breathing issues and shock. Many people who have severe allergies carry EpiPens with them, but EpiPens won't solve the problem. They contain epinephrine (adrenaline), but the real solution to serious allergic reactions is an antihistamine like Benadryl. Even if the person uses their EpiPen, they still need to be evacuated from the wilderness to a hospital. If you know someone who carries an EpiPen, make sure to ask them if they carry antihistamines as well. There are many, many more important lessons in WFA, but not enough room to list them all! Have you taken it, or something similar? What are some of your key takeaways? If you haven't taken it, will you? Leave a comment! Thanks for your review, Katie. I really need to take some medical training. I knew some friends who took WFA and they said most of the solutions was to "evac". I wasn't thrilled with this solution since that's not always possible or a fast solution. It seems you had a different experience. Where does one begin? WFA, WFR, Red Cross stuff, etc. ?? There's so much out there. How does someone weed out the useless stuff from the good stuff? I gotta get on this. Maybe this winter. It's a hole in my skillset. Glad you like the post, Gif! In WFA, we learned how to keep a patient stable until help arrives and to make evacuation decisions. We learned how to determine basic ailments, but not how to diagnose. WFA is by no means a comprehensive guide to everything you'd need to know about wilderness medicine, which is why my second key takeaway was an understanding of the purpose of the class. If there are injuries, you'll likely still need to evacuate. 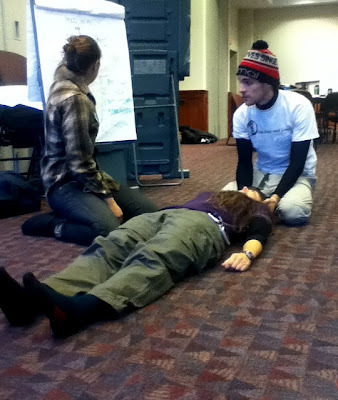 If you're looking for a more comprehensive class and for a set of skills to help you treat people in the wilderness, WFR or WEMT is what you'd need. It's definitely a valuable class, though. You learn a lot of very important basic skills. I'd check out the NOLS WMI website (http://www.nols.edu/portal/wmi/courses) for a list of upcoming courses. Hope you're able to get to one, and let me know how it goes! Awesome, Ashley! I'm a huge NOLS WMI fan too, they do an incredible job. Great article Katie. I think that you did a phenomenal job of encompassing many of the points to the First Aid class you took. Like you mentioned I would highly recommend anyone who travels in the backcountry having a minimum of a WFA certification and if they are excited by the class, a WFR. 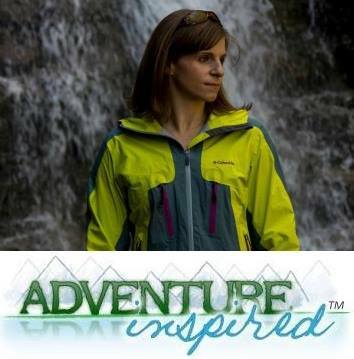 I work in the industry of Outdoor Ed. and maintain a WEMT cert which I find invaluable in aiding my decision making in the backcountry. Thanks, Travis! WFA is a great stepping stone to more significant certifications, like yours. I like that WFR and WEMT seem to be a prerequisite for many outdoor ed jobs!